What a killer way to put a spin on the [first] date from hell experience us lucky few got to partake in in high school. I should back pedal a bit and state that I was not actually one of those lucky few I just mentioned. High school and dating were polar opposite topics from one another. First I had to figure out whether the person I was interested in was available (and I mean "available" beyond simply dating another). Next I had to figure out how to take ownership of that interest--should it exist--to propose a date. All this done under secrecy of course. Needless to say, I never got to the ownership portion because trying to figure out whether a person was interested in me took the energy of a Hercule Poirot investigation to find a conclusion. And said conclusion was always one of complete and utter disappointment. Therefore, I stuck with my books as a general rule. 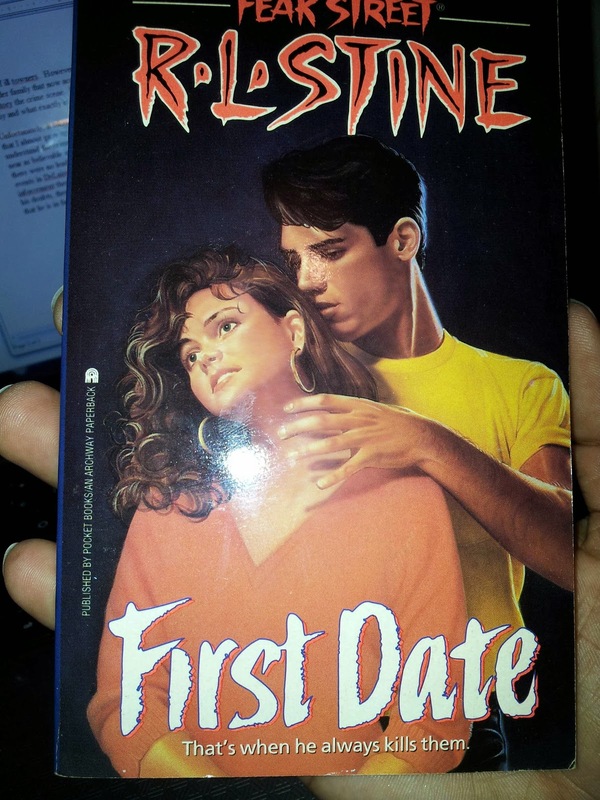 First Date by R. L. Stine being one of them. No, actually, I wasn’t even thinking about dating sometime in middle school when I first read it. So here I am re-reading the book and my dating game hasn’t grown by anything other than a centimeter. But that’s neither here nor there at the moment. Staying on topic, I picked up and re-read First Date as a Booktube Read-Along orchestrated by me and another Booktuber named thefictionfairy. I drew the book out randomly, sticking my hand in the light blue tub that I sadly keep all of my 52-Plus-Some Fear Street books today. I need a bookshelf, naturally. Nevertheless, First Date was what I drew out. I frowned in a curious manner, realizing that it seemed almost coincidental that I picked this book up blindly and could not remember a single incident that took place between its 165 pages. Like I said, it’s been years. I stopped reading/collecting Fear Street at the end of ‘97, so it had to have been at least seventeen years since I read it. And while I can easily pick up the majority of Fear Street titles and recall their stories, this one I couldn’t. This led me to the realization that this might’ve been one that I read only once back in the day. Fast-forward to 2014 and you can consider me pleased to have spent my morning reliving the nostalgia created by venturing back into an R. L. Stine thriller. Honestly, it was like slipping into an old pair of shoes, but with a fresh pair of eyes. Like many of Stine’s Fear Street books, the plot to First Date is simple--as well as the writing. Fifteen-year-old Chelsea Richards is the new girl at Shadyside High, and she also comes across as terribly unself-confident. Seen as shy, and often self-serving nasty jabs at her weight, Chelsea is quiet and lonely; however, she has created one friend, Nina, at her new school. It doesn’t help that Chelsea’s one friend often (but not always) disregards Chelsea's personal concerns to relish her own, particularly in the form of her turbulent relationship with her boyfriend Doug. This bit of aloof behavior from her friend only stirs further insecurities in Chelsea. Additionally, so does to the un-ignorable fact that Nina has a boyfriend, as opposed to Chelsea's boyfriend-less reality. Nevertheless, high school life gets a little more interesting when Chelsea encounters a new boy named Will, who appears equally shy as her. In chorus to the plot, a boy who goes by the name Spark converse with the shy Chelsea while she‘s on the clock at her father‘s restaurant. Suddenly Chelsea has two guys coming for her attention. The problem is that one of them is a neurotic murderer on the lam! First Date was probably R. L. Stine lite, at least in my estimation. I can recall a few gorier books where some scenes were to wild to forget. Remember the wheelchair girl who stabbed her friend with an ice skating blade in Broken Hearts? Or Holly strangled with her own scarf in What Holly Heard? And let us not even forget to mention the characters that stick with you. Of course my favorite is Corky from his cheerleader series, but also Emily from The Stepsister. Not to mention the rich, snobby Reva Dalby from the Silent Night trilogy and Honey from Best Friend. In any regard, the death count and memorable characters in First Date are limited, but Stine provided a strong peek into the killer’s psychology as well as that of Chelsea’s. I can never decide which do I like most between Stine’s murder mysteries and paranormal style books. Actually, that’s not even a legit question. I love them all. Well, there are a handful of Fear Street books I didn’t to much care for and one that I never managed through. Nevertheless, what I will say is that Stine is certainly the numero uno author on my list of writing influences. And that was evident as I read First Date. It brought me back to days in school where I was happy for in-house suspension because I could sit at a desk all day--for a whole exciting week--writing stories similar to his. Many of those stories I still have, both a combination of murder mystery and paranormal stories. He is responsible for my love of the mystery genre and is probably a solid example of urban fantasy and the YA fiction of today. Per your taste, of course. Now I want to stick my hand in that big blue tub and pull out another one. 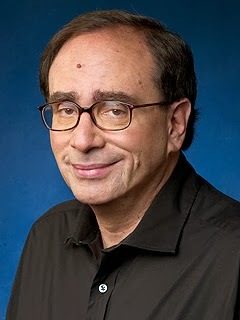 Did you grow up with reading R. L. Stine--Goosebumps or Fear Street? What is your fondest memory engaging with this numerous catalog of middle grade to teen thrillers?